1. Preheat the oven to 150°C, gas mark 2. Butter and line the base of a 20cm springform tin with a disc of baking parchment. Melt the butter in a small pan. Crush the biscuits in a freezer bag using a rolling pin and tip into a bowl. Add the melted butter and mix to combine. Press the buttery crumbs into the base of the tin in an even layer and bake for 5 minutes. 2. Combine the soft cheese, mascarpone and 125g caster sugar in a bowl, and mix until smooth. Add the eggs, soured cream, lemon zest and vanilla, and beat again until smooth. 3. Wrap the tin in a double layer of foil, place in a roasting tin and boil the kettle. Spoon the cheesecake mixture into the tin and spread the top level. Pour boiling water into the roasting tin so it comes one third of the way up the outside of the cake tin. Carefully place into the oven and bake for 50-55 minutes, until set but with a slight wobble in the middle. 4. While the cheesecake is cooking, prepare the caramel. Line a baking sheet with baking parchment. Tip the remaining 125g caster sugar into a heavy-based saucepan and add 2 tbsp water. Warm over a low heat, without stirring, to gently dissolve the sugar. Raise the heat to medium and bring to the boil, until it becomes an amber-coloured caramel. Swirl the pan as the caramel starts to colour to ensure it cooks evenly. Quickly pour the caramel out onto the prepared baking sheet and leave until cold and set hard. 5. 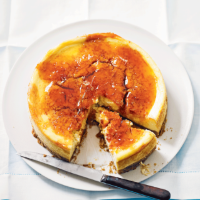 Break the caramel into small pieces and scatter evenly over the top of the hot cheesecake. Return to the oven for a further 10 minutes so it melts evenly over the top. Remove the cake tin from the roasting tin and leave to cool to room temperature before covering with clingfilm. Place on a large plate or baking tray and chill overnight in the fridge. The hardened caramel will soften in the fridge and become a syrup on top of the cheesecake. Cut into slices to serve.